Kiln Access Ramps get personnel and equipment in and out of the kilns safely. Each ramp is custom designed by certified professional engineers and is made with high grade 6061 T6 aluminum, strong as steel and half the weight. Lightweight T6 aluminum construction is easy to handle and install, most ramps install in 1.5 – 2 hours. The ramps are designed to support 15,000 lb (6,804 kg) live load with a 3:1 safety factor and increase productivity by allowing fast efficient material and equipment access. Brokk outrigger matting support is also available for kiln tear out on the bridge section of the ramp. Our ramps are custom designed to fit your specific burn floor with precision. 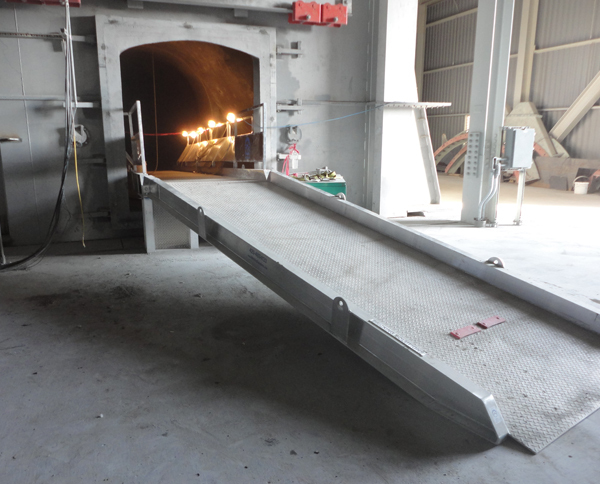 Personnel ramps are also available and increase safety by ensuring safe passage in and out of the kiln. Consider a Safety Cage Tunnel System spanning the bridge section of your ramp to protect workers from castable in the hood. Sign up to stay informed with the latest product news from Bricking Solutions on refractory maintenance!